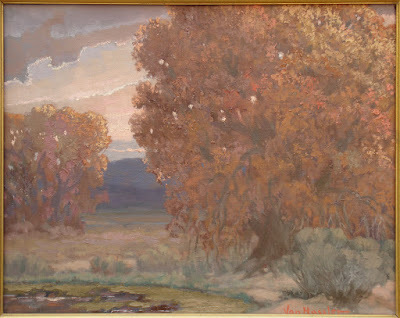 Oil on linen, 14" x 12"
Von Hassler was called "The Dean of Albuquerque Artists." He said, "Nature is a great teacher. To be a truly good artist, one has to be first a naturalist. Each area presents its own background and feeling. Arizona is quite different from New Mexico. Our state is very different from Colorado—and so it goes. Unless you get the feel of a place, your painting will lack strength and beauty." Von Hassler said it's impossible "to elaborate on nature with success. I want to place on canvas what I see in nature." Parsons does not offer Carl von Hassler prints, because no print can compare to the real paintings. 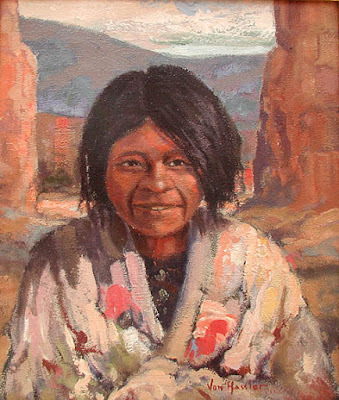 He was known as "The Dean of Albuquerque Artists." Von Hassler was born in Bremen, Germany March 18, 1887. In 1901 he was enrolled in the German Naval Academy, where he took art classes. Carl studied for 6 years at the Dusseldorf Art Academy. In 1912 Von Hassler went to the United States. He joined the "Greenwich Ash Can Group". in 1917 Von Hassler became a member of the US Army, serving 4 years fighting against his homeland, Germany. 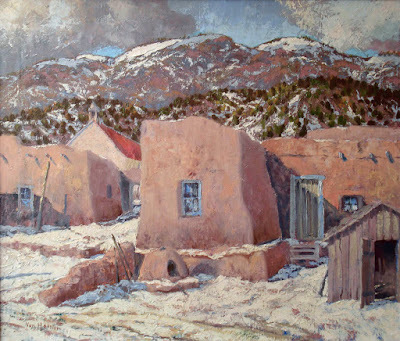 In 1922 he went to Albuquerque, New Mexico. In 1924 Carl painted the Indian motif mural in the Franciscan Hotel, Albuquerque, NM. In 1927, he painted murals for the Pueblo/Deco style KiMo theater in Albuquerque, NM. In 1937 He created the viga designs at Albuquerque airport. Carl von Hassler died in Albuquerque, NM on November 30, 1969.